A must-have fashion accessory, the small leather messenger bag for men combines classic style with a contemporary finish. Made from black Italian leather, our messenger bags personalised with your photos or design are simply stunning and totally unique. Buy a custom messenger bag for the fashion conscious men in your life. Our leather messenger bags custom made featuring your own photos or unique design are a real fashion statement for men and women. Made from the finest Italian leather with a thick webbing strap and chunky metal fixings, these over the shoulder bags allow you to easily carry tablets, e-readers or books wherever you go. Available in a choice of three different sizes, with your photos printed on the front, and a handy zip pocket at the back. Adjustable, removable, thick webbing strap included. The products I have purchased turned out great and very good quality. The bag was bigger then I expected but overall the print on the bag I designed turned out exactly like I wanted. Fast shipping. Great customer service when I needed help with designing. Thank you and would definitely order more products. Device bag was very quick. Delivered in 2 days.Item very nice & good standard. I ordered Coasters and Place Mats. They are great quality and we absolutely love them. I also ordered a Messenger Bag. It is a lot bigger than I realised, but again great quality and I will use it as hand luggage when I go on holiday. Who Would Love Their Own Custom Messenger Bag? Personalised messenger bags for men are ideal for keeping any important documents or accessories safe and secure when on the move. The commute to work can be stressful and busy, but the compact size of these custom messenger bags makes travelling fuss-free, so they’re perfect for your husband, brother or son who is tired of slogging a heavy briefcase around. Forget bum-bags from the 90s! 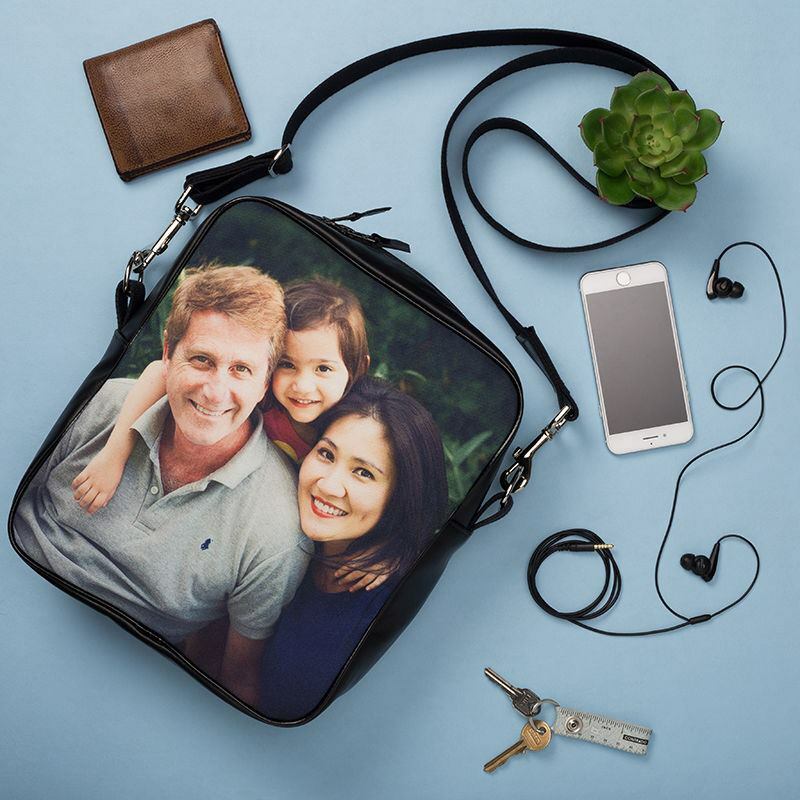 The small personalised leather messenger bag makes a fantastic holiday bag that keeps your passports, currency and tickets safe and sound - perfect for the safety conscious parent. They’re also great for university/college students who want an alternative smaller messenger bag for days when there’s only one lecture. Personalised with photos of their teenage years, this is a cool gift for your son or daughter. Like many of our products, the personalised messenger bag comes with a quantity discount, so buy more than one today and save money. Care: Wipe clean with a damp cloth. Distressed leather look develops after 12 months of use. All of our personalised messenger bags are handmade to order in London, UK. Your photos or design are printed onto the leather using a specialist process. We then cut and handcraft the fabrics to create a bag that is unique to you. The Italian leather has a natural shine to it, however, after a year it will develop a distressed appearance to show off all the natural characteristics of this beautiful leather. Distressed leather is a desirable look for messenger bags, and with a custom printed photo, yours will just ooze authenticity! Bold, chunky designs bursting with colour work Nappa well on our personalised messenger bags. The photo area is on the front only but if you can’t choose just one image, create a bespoke photo collage with all your favourite snaps. For a quirky creation, print your favourite book or movie cover. This is a great way to show the world your personality and what’s more, you could even make a new friend on the train who shares your interests! Our personalised messenger bags are so versatile, so if you’re heading to the Costa del Sol, take them as hand-luggage custom printed with your favourite holiday or honeymoon photo. Our Personalised Bomber Jacket for men is a handmade bespoke jacket, which can be designed online at Bags of Love.